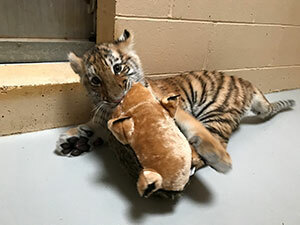 Our male tiger cub, Kashtan, enjoys playing with the stuffed hedgehog received from the 2016 Giving Tree Wish List. Thank you to all who remembered our animals during the holiday season, and donated to this year’s Giving Tree! Our Giving Tree was displayed in the U.S. Bank Gathering Place, adorned with ornaments featuring enrichment items needed by our Zoo animals. Each ornament was handmade by the Zoological Society’s Zoo Pride volunteers, and displayed the animal’s name to receive the item, a description of the enrichment item, the item cost and suggestions for where items may be purchased. Male hippo, Happy, received a cash donation for his keepers to purchase watermelons for his enrichment. In addition to a large number of gifts purchased for the animals, many monetary donations were also received. The monetary donations gave zookeepers the opportunity to purchase items most needed for specific animals in our collection. Enrichment enhances all aspects of an animal’s welfare by addressing the behavioral, environmental, physical, psychological and social needs of each individual animal, based upon the natural history of the species. Enrichment encourages displays of behaviors similar to what would be seen in the wild. Here is a sampling of some of the items received this year. On your next visit, you may see these animals with their new enrichment food and toys! Thank you again for your generosity – it is much appreciated!